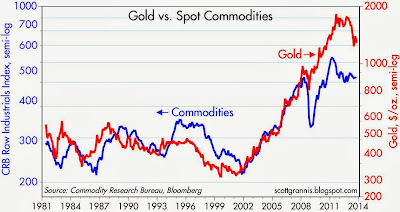 In a post last April, I introduced the thesis that gold's "second great rally" was over, and that gold prices would probably realign with commodity prices at a much lower price. With gold down some $40 today, it's as good a time as any to revisit this issue. As I read the chart above, it continues to suggest that as a first approximation, gold prices are headed to $900-1000/oz. When gold prices reached $1900/oz. two years ago, I think it was because the market was betting that all sorts of things would go wrong: the Fed's QE would create hyperinflation, the dollar was going to crash, and/or debt defaults in the Eurozone and possibly in the U.S. would lead to another financial Armageddon. Since then, it's been a case of the "dog that didn't bark." 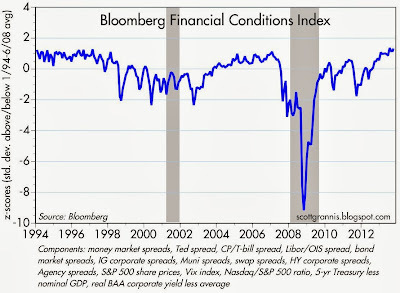 Nothing terrible has happened: inflation is quite low, the dollar has picked up somewhat, the Eurozone economy is once again growing, and debt default concerns have faded. Today we've seen that yet another shutdown of the U.S. government has (so far) proved to be a nonevent. 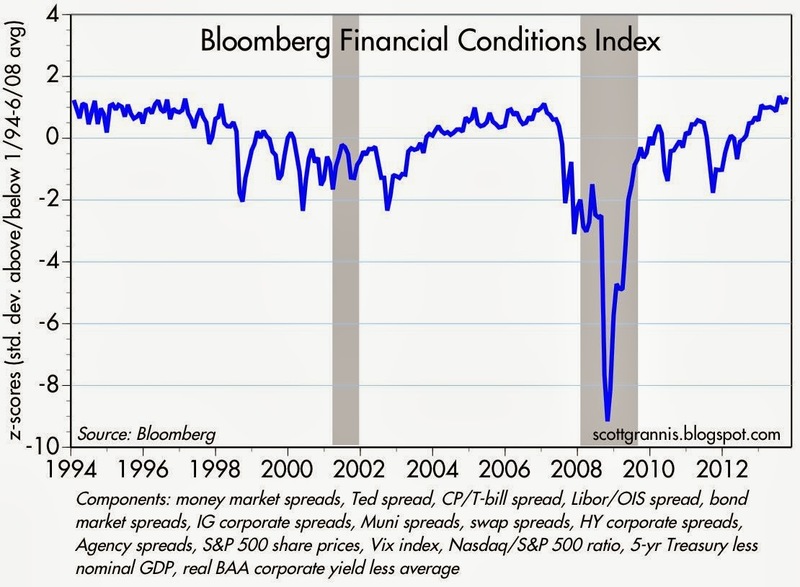 (See above chart: financial conditions have rarely been so tranquil as they are today.) No one seriously believes the U.S. will fail to pay its debts. Even though federal spending represents 20-21% of GDP, fully two-thirds of that spending comes in the form of transfer payments—taking money from one person and giving it to another, and that doesn't get shut down. Abstracting from transfer payments, which unfortunately lead to perverse incentives (those who pay are generally more productive than those who receive), the federal government only consumes about 7% of GDP. By its gargantuan size and nature, government is already a big drag on the economy, and a bit less government can't be such a bad thing. The big news, however, is that the debate over the shutdown centers around the role of government. Should the federal government be pushing us all into a government-controlled healthcare system? Can government ever hope to efficiently manage the entire healthcare industry? Republicans are in a sense trying to save the Democrats from their own healthcare folly by conditioning a Continuing Resolution on a one-year postponement of Obamacare, a massive and intrusive program that is simply not ready for primetime, as I discussed last week. But since the Democrats are determined to ignore the huge flaws in their program, and since Obama refuses to negotiate, we're in a stalemate. As Ilya Somin points out, "there is considerable symmetry between the two sides’ positions." There's not much symmetry, however, to be found between the government's rollout of Obamacare exchanges and Apple's rollout of iOS 7, contrary to Obama's assertion today. As Obamacare exchanges—over three years in the making and targeted to a mere 30-40 million U.S. residents—today opened for business, failures and shutdowns were widespread and predictable, preventing millions of users from signing up—and that is just the first of what are sure to be many more glitches and disasters. If Apple had bungled a software or hardware rollout to the same extent as HHS has, its stock would have tanked, and for good reason. Apple likely had less than 2 years to prepare for its software rollout, which was targeted to upwards of 700 million users, and, save for one minor glitch which affected no one's ability to use the new software, had to be ready to go in dozens of languages around the globe from day one. As it turned out, over 200 million were able to successfully download and use Apple's new software in just two days, and well over half of Apple mobile devices have been upgraded to date. Though terribly inapt on Obama's part, his comparison may prove to be very beneficial, since with more time we will discover more Obamacare problems, and with more time we'll discover that the economy can survive without the myriad ministrations of the federal government. Apple has already exceeded the expectations of hundreds of millions of users in a matter of days, whereas Obamacare will almost certainly fail to deliver on any of its promises in the next few months and years. Moral of the story: we'd likely be better off with less government intrusion, lower tax burdens, fewer regulations, and a healthcare system that relied more on private sector initiatives and less on government mandates to cut costs and expand coverage. Perhaps the gold market is beginning to understand that the sound and fury coming out of Washington could be the beginning of the end of Big Government. Between now and next November, political discussions are almost certainly going to be dominated by the issue of whether or not our government has become too vast to function effectively. The failure of Obamacare to work as advertised, contrasted with the overwhelming success of Apple's iOS7 launch, will hold lessons aplenty for years to come. Would you entrust your health to government the same way you entrust Apple with the management of your digital life? I sure wouldn't, and maybe millions of others will come to agree with me. We didn't create the federal government to compete with private enterprise and individual initiative; we created government to ensure that private enterprise and individual initiative can flourish. If, as a result of all this mess, government is more likely to shrink than increase in size and influence, then the outlook for the economy, I would argue, has improved. And that does not support a gold price that is still more than double its average, inflation-adjusted price over the last century. Your blog is fantastic, it has really made a difference to my investing. Thank you. Oddly enough, the right-wing fully and aggressively supports federal health care, and even non-profit health care operated by federal employees for 22 million Americans--it is called the VA. The right-wing would gain some credibility if it called for privatizing the VA. But it never does. That tells me the right-wing believes that the federal government is capable of running very large health care programs, and directly at that. So the right-wing believes federally operated, taxpayer-provided health care with zero copayments, but only for veterans---not for taxpayers. Unlike the right-wing, I am not sure the federal government can oversee running large health care programs. The experience in Europe and Japan suggests single-payor works better than the current hybrid and corrupt American model however. IMHO, Obamacare is too complicated. "The experience in Europe and Japan suggests single-pay or works better than the current hybrid and corrupt American model however." How would your describe the VA? If it is inferior care, are you suggesting that the GOP is maintaining a system that is inferior, at the expense of vets? If is superior care, and funded and operated by the federal government, why can not that system be duplicated on a larger scale? The federal government does a good job in operating a system for 22 million vets, but it cannot play a role in universal health care? I see no rhyme or reason in the GOP's fervent support for the VA, and their opposition to federally influenced universal care. Remember, the GOP often calls for cutting everything except defense and the VA. The latest was a vet whom was given drugs to self-medicate and unfortunately overdosed...Very sad! Why are you suggesting only the Repubcos are maintaining the VA? There are literately thousands of vets whom are receiving little or delay services..
We need a Marshall plan for medical care, starting now..
goes back to your blog and not to the reference article. Thanks. Ilya Somin link fixed. Thanks for spotting that! On Thursday, October 3, 2013, Spot Gold, $GOLD, closed at $1,316, with support lower at $1,300 and a strong floor at $1,275. The chart of the Gold ETF, GLD, rose slightly, to the edge of a massive consolidation triangle, to close at 127, from which it will either break out, or break lower. Either way, it is wise to Dollar Cost Average, an investment in the purchase of gold bullion, as in the age of authoritarianism, the possession of gold and diktat, will be the two forms of sovereign and sustainable wealth. The late September 2013, S&P 500, $SPX, price of 1709, and SPY price of 172, reflects an Elliott Wave 5 High. Thus the October 1, 2013, rally marked the short selling opportunity of a lifetime, as in a bull market one buys into dips, but in a bear market, one sells into pips. When fiat money died Friday September 20, 2013, with the trade lower in World Stocks, VT, Major World Currencies, DBV, and Emerging Market Economies, CEW, a new form of money rose to govern mankind’s economic transactions, that being diktat money. Thursday, October 3, 2013, was a bearish day, as ETF Daily News reports Outer limits of monetary policy and inflation and the Finviz Chart of the Market OFF ETN, OFF, rose, and the Yahoo Finance Chart of Volatility, ^VIX, also rose, stimulating Volatility ETFs, TVIX,VIXY,VIXM, higher. The Great Bear Market that commenced Friday September 20, 2013, recommenced Thursday, October 3, 2013, as is seen in the 200% Bear Market ETFS, such as BIS, FXP, SQQQ, SDD, SSG, trading higher. Hello Scott. Question for you. If Gold were to fall to your $900-$1000 level, where would you see the XAU Index of Mining Shares? Thanks. Jim P.